Another aspect of Smith’s art which I believe attests its quality is the consistency, the coherence of his particular way of seeing. His paintings look like paintings by him. He has found a personal style, or perhaps one should say forged a personal form of expression, through a meticulous repetitive exploration of a limited range of themes. We are back to the dialogue between a poet and his reader and it is Schiller, the poet, who warns every critic of the limitations of language in the world of art. “Language puts everything in terms of reason; but the poet is supposed to put everything in terms of imagination. Poetry calls for vision, language supplies only concepts. This means that the word robs the object it is meant to represent of its sensual and individual nature and thrusts a property of its own upon it, a generalness which is foreign to the original object, and so the object either fails to be represented freely or being only described is not represented at all”. 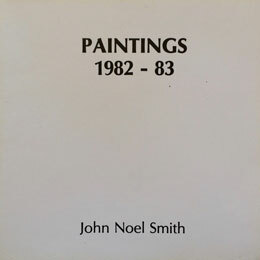 Paintings 1982-1983 – John Noel Smith. Dublin: Project arts centre, 1983.